A war has been brewing between the Everest rescue/insurance companies and the local operators for years now. This summer the battle hit the tipping point when a thorough investigative report by AFP reporter Annabel Symington found systematic cooperation amongst local guide companies, helicopter services and even some hospitals in Kathmandu to scam the rescue/insurance companies through fraudulent claims. An investigation by the Nepal government verified the charges. As usual, the Nepali government went into damage control but it remains to be seen if anything of substance changes. However trekkers and climbers going to Nepal, and even Pakistan, from now on need to double and triple check their evacuation/insurance policies before leaving home and make sure their guide and their office has all coverage details including phone numbers, coverage limits and policy numbers. For years there have been whispers about trekking companies, and some climbing guides, using fake rescues to scam insurance companies. The AFP report details the scam: It usually involved a client who demonstrated some form of altitude sickness – headache, nausea or fatigue. The guide would tell them that if they went higher, they might die and their situation was so urgent they needed to call for a helicopter “rescue” knowing they had insurance to cover the costs. The guide would immediately call their favorite helicopter company from whom he would receive a “commission”. The client would then be flown to a Kathmandu hospital, where once again a “commission” is paid to the parties involved. The helicopter flight was usually packed with multiple “patients” or sometimes just people getting a free ride from the rural areas to Kathmandu. Once all this was completed, a bill was sent to the insurance/evacuation company usually in the USD$3,000 to $6,000 range just for one helicopter flight depending on altitude and distance flown, but in some cases there were four people who all took the same helicopter. In other words, a $4,000 evacuation would yield $16,000 in insurance payouts when each person’s insurance company was billed independently. But the scam didn’t stop with the helicopter flight, it went on at the hospitals where unnecessary tests were run involving keeping the “patient” for a few days totaling thousands of dollars in bills, once again paid by the insurance companies. Some reports suggest that trekking companies offered under-cost prices for treks knowing that they would make it up with insurance fraud. They would make more on a fake helicopter claim than the $1,000 they charged the trekker for the entire trip. A report in News4Europe quoted Prakash Sharma Dhakal, deputy spokesperson of the Culture, Tourism and Civil Aviation Ministry, “We found that a local agent billed the insurance company US$57,972 for evacuating a group of trekkers. In another case, they found that a local agent issued two separate bills for one rescue. The insurance company was billed US$100,757. The Nepal Ministry of Tourism (MoT), understanding that this was a serious threat to their tourism business launched their own investigation in late June. Aviation Nepal reported in August 2018 that 15 companies, 8 trekking and rescue companies, 4 hospitals, and 3 helicopter companies were cited for fraud but there has been no further information on the exact penalty. The companies listed were: Manang Air, Air Dynasty and Heli Everest, Rescue, Kailash Charter, Easy Heli, Eagle Heli, Flight Connection, Alpine Rescue and Mountain Heli. The hospitals included Vayodha, Swacon International, New Era and Ciwec. AFP reported that the tourism ministry probe found more than 1,300 helicopter rescues in the first five months of 2018, costing insurers over $6.5 million. The investigation looked at 36 trekking companies, 10 helicopter companies and six hospitals. Alarmingly, the investigation also uncovered evidence of guides putting baking soda — a laxative — in food to give tourists diarrhea and then pressuring them to be evacuated by helicopter. The aviation publication, Vertical, said that Airbus’ helicopter sales to Nepal have been booming with sales of the AS350 series: the AS350 B3e, now known as the H125 delivering over 20 new machines during the past few years to the Nepalese Army, Shree Airlines, Simrik Air, Fishtail Air, Air Dynasty, Heli Everest, Mountain Helicopters, Altitude Air, and Manang Air. In August, several rescue and insurance companies from Britain, Australia and New Zealand gave Nepal a September 1, 2018, deadline to institute a solid process to stop the fraud or they said they would stop issuing insurance policies for trekkers and climbers. This could have a serious impact on the tourism business. AFP reported that the companies demanded that all helicopter rescues are pre-approved and capped at $4,000 per flight. The US company, Global Rescue, said they have complained to Nepal officials for years with no results. Kathmandu based newspaper, ekantipu reported that the MoT’s 700-page probe report to Tourism Minister Rabindra Adhikari recommended that starting in September 2018 all rescue activities be performed by the Nepal Police to stop the insurance scams. It is unclear if they intend to have qualified rescue staff based across Nepal for a swift response to emergencies or they will simply subcontract to existing guide services while claiming to supervise the financial flow to the insurance companies. Similar rescue units on other mountains like Denali or Aconcagua are staffed by highly training mountaineers with extensive medical training. They are positioned at mid-level camps throughout the climbing season and offered at no charge to the climbing community. Finally, one specific battle has come to light between US evacuation company, Global Rescue (GR) and Sherpa owned and operated Seven Summits Treks (SST) over non-payment and non-compliance for several of their clients. Specifically, the spring 2017 rescue of Pakastani climber Dr. Abdul Bhatti and his Sherpa Guide, Sange Sherpa employed by SST. A recent HBO Real Sports special highlighted this incident and I have covered Sange’s plight in detail on this blog. We are very familiar with rescue in the Himalaya, Everest in particular, where we have been averaging 100+ missions per year with dozens of rescues from the high camps for those who have contacted us either directly or through their guide companies. Unfortunately, 7 Summits refuses to do this and instead relies on their own Sherpas and helicopters to perform their rescue and transport missions. As you know, this is a direct conflict of interest and given their business practices, not something we can be involved with. In the case of Mr. Bhatti, we were not notified until after the rescue was complete. In the case of Larry Mah, we were ready to deploy our rescue team and contracted helo immediately, but were told to stand down by 7 Seven Summits and that they would use their own. This, coupled with the fact that they unnecessarily forced their employees into such dangerous situations (see HBO segment above) makes these rescues (and what they are claiming) problematic. Even if we had the ability to provide reimbursement (which we don’t since we are not an insurance company) we would never play a role in supporting this kind of behavior. On a side note, I have used Global Rescue and TravelEx for many of my trips and have always been aware that “pre-approval” was needed. Also, every guide I ever used asked for proof of evacuation coverage along with the policy number. On two occasions, I have been helicoptered off Everest and in both cases the guide’s office team, one in Kathmandu and the other in the US, contacted my “insurance” for pre-approval and everything went smoothly. Global Rescue defends their pre-approval process as necessary to prevent fraud and provide the service their customer paid for. I asked Dan Richards back in May during the Everest 2018 spring season if there was a conflict with some guide companies owning their own helicopters and perhaps claiming a member was sick then charging GR for the rescue to generate income. He said this “conflict of interest” is one reason why they have a strict policy on pre-approving all evacuations and which helicopter companies they use. He told me then that all evacuations must be organized and provided by GR. A GR rescue specialists (generally a medic or a doctor) is either on the ground or in the helicopter to oversee the operation and provide immediate medical assistance. He said they do not work with operators that are not transparent with helicopter service records and pilots that don’t have high-altitude training and experience. He called out STS by name in our conversation. Note that this specific situation between GR and SST took place in 2017 well before the AFP article and government investigation on fraud. “Everest Inc.” is, in fact, a large, complex business filled with opportunities for unscrupulous characters. When the people charged with the oversight are in on the scam, it becomes impossible for real change to take place. But the scams and problems go way beyond insurance fraud, it includes Nepali owned and some foreign companies underpaying Sherpas, not providing safe climbing gear, pressuring porters and staff to carry heavier than recommended loads and more. When the Sherpas went on strike in 2014, after the 16 deaths in the Icefall, their demands to the Nepal government for “OSHA” type protection went ignored. 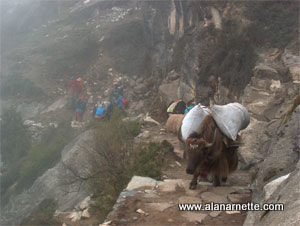 The Sherpas were viewed as already enjoying a high standard of life compared to the rest of Nepal. I advocated then and again now that the only way to get change in Nepal is with money. If the tourism industry were to dry up or even be cut in half by people stopping their visits to Nepal and voicing their concerns about government policies, and those of cut-rate operators, change might have a chance. But I’m being naive now. The competition on Everest has moved from a safe, quality experience to simply who has the lowest price. Human nature is driving an insatiable appetite for deals, so we can expect to see more of the same corruption, bribes and lack of legitimate oversight. If climbers, trekkers and tourists care about Nepal, they should vote with their money and only use qualified, safe, reputable guide services or don’t go at all which will hurt everyone. But sometimes, change hurts. Hi Alan…so off topic but wondering how your rehabilitation is going and any personal climbs you have planned? Thanks Colin. Update soon but I’m doing well Thanks!